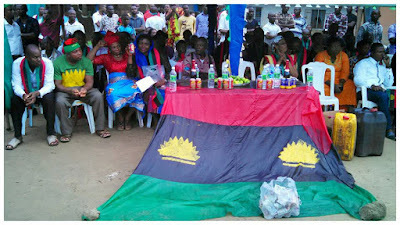 Until Biafra comes IPOB family in Igweocha will not rest in taking this gospel of truth to different part of villages, communities and streets in Igweocha Biafra land. This very inauguration which took place on the 30th of October, 2016 was a very wonderful one. The inauguration takes the street, door to door and also was organized in an open field. 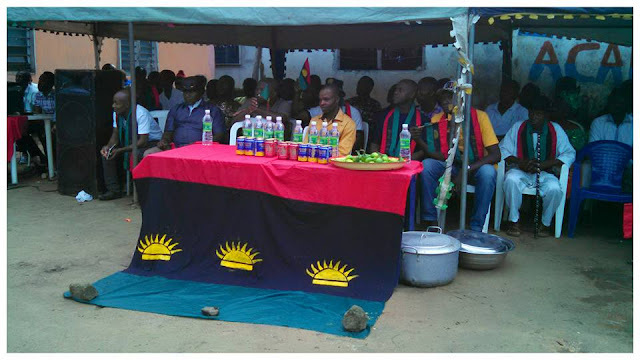 No matter any kind of arrest the zoo military are arresting our people; IPOB family in Igweocha has stood their ground in inaugurating IPOB families in all parts of Igweocha. This inauguration which started by 4pm Biafra time was presided over by some inauguration committees and some Igweocha media team. The open field where this inauguration took place was beautified with Biafra flags and the Obigbo central zone members was dressed in a Biafra muffler each which also made the inauguration ground more colourful. The inauguration committees spoke to the members of the new zone the important it is for them to be strong and resolute in the Biafra restoration. They also advice them to follow a good part and never to involved themselves in any act of insubordination or be a party in sabotaging the Biafra restoration. You have embarked on a journey which is the restoration of Biafra and u must make sure that you must carry it to an end they committee advised them. Remain focused and consistent and abide to the rules and regulations which is guiding IPOB and which is 'COMMAND AND CONTROL' they also advised them. Obigbo central zone is a very big zone with a good number of members in it. They are made up of men and women of valour and I can see the spirit of Nnamdi kanu in most of them. They are young and vibrant men and women who have what it takes to bring the zoo to total destruction. I also saw love and unity among them irrespective of their different tribes. Item seven was never missed out in the inauguration. As there are a lot of things to drink and eat there. Group pictures were also taken while some were interviewed. Many people have waken up from their slumber and are joining the struggle on a daily basis. IPOB family in Igweocha has vowed to take this campaign to every parts of Igweocha so that everybody will be fully sanitized. There are a lot of zones, units and wards that has been inaugurated in Igweocha so far and many more are yet to be inaugurated. IPOB Igweocha are not relenting nor surrendering, they are not afraid of Buhari and his murderous military, all they know is that they must bring this restoration of Biafra to accomplishment. They are not asking for any other thing other than their freedom from this hellfire called Nigeria which is their fundamental human right. Nigeria is not a better place to be, if you are living in Nigeria, you are in hellfire as simple as that. And for that reason, Biafrans who are suffering from this hellfire called Nigeria for many years now wants to be free from it. Thank Chukwu okike Abiama for given us Nnamdi kanu who has opened our eyes to see what we could not see before. He has made a lot of people to begin to reason like human. He has restored unity among all Biafrans and has abolished the divide and rule tactics which has hold us hostage for many years even till today. Our prayers is that Chukwu okike Abiama will grant him freedom from the enemy’s camp. Biafra must come under the watchful eyes of mazi Nnamdi kanu. No amount of arresting, killings and kidnapping will make us to slack back in this mission which we have started. Since many people have died in this struggle, mothers became widows and childless for this reason, we must strain every nerve to make sure that Biafra comes so that the spirit of our gallant heroes will rest in peace. And those is alive will begin to live a good life and also have benefits that is entitled for a citizen of a country..Biafra is our aim, Biafra is our goal, Biafra is the hope of a common man. Biafra must be restored no matter how long it takes. Even if it requires war, we will fight to finish to make sure that Biafra comes.